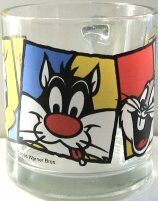 Here is a collectible glass mug featuring Sylvester, Bugs Bunny and Tweety. It is 3 1/2" high x 3" in diameter, not including the handle. Copyright 1994, Warner Brothers. Previously owned but in good condition.